When I started my Linux software company in 1999, I scoured the world for talent that matched my needs. I had programmers in Romania, Russia, Ukraine and England. Internet was all dialup in the first 3 of those and hardly anyone of them could speak English, but they could type it, so as a result, I never actually met any of the 20 odd people working for me and only ever spoke to a handful on the phone. We did everything with ICQ instant messenger and IRC group chat. I moved us to Jabber when it became available and we even built various collaborative tools in to the Jabber platform like Whiteboarding and conferencing, Google chat was originally built on Jabber as well. Our ability to grow and market over 50 software products on a half dozen platforms in a fully distributed environment like that, impressed enough people that I had a half dozen offers to buy my company, sadly all of them went bankrupt during our negotiations. Collaborative tools and platforms have come a long way in a very short amount of time. You’ve got Google hangouts that is free and built in to everything Google is doing, and frankly, it works great for the bulk of my IM, video conferencing, file sharing and collaboration needs, but the latency isn’t great. Hangouts it isn’t without it’s failings, such as ease of recording a meeting locally instead of having to go through a whole strange YouTube process, and it also assumes your entire ecosystem is based in Google. Blue Jeans is an interesting one in this market as they are relatively new (2009), with a focus on cloud managed video conferencing. They have really focused on high resolution, low latency technology that can be deployed across virtually any device. They have created something extremely easy to use that can scale to a ridiculous level in terms of number of concurrent people. By managing the interoperability aspect of it, you don’t have to worry about people at the other end having the right kind of software installed at the other end, so as simple as putting on a pair of blue jeans. I know a client of mine that spent $2 million building video conferencing between 2 offices in the late 90’s, would have really liked having this instead. GoTo Meeting is really the pioneer in this space, building off the Citrix tool stack for virtualization, they really saw the need and latched on to it early. Originally just being a screenshare environment and then morphing in to online conference rooms, VoIP and video. I’m not sure how well this division will continue to survive, but Citrix keeps finding more niches to address with that original core technology of GoToMyPC. 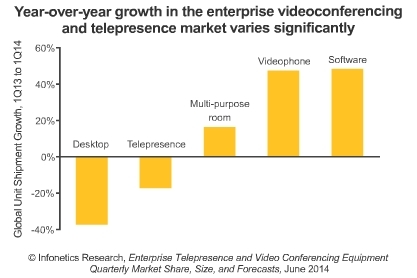 Infonetics Research shows a real growth in software based communication and a shift away from hardware based telepresence systems, which is a real problem for a company like Cisco, which is one of the largest vendors of telepresence systems in the world, and a big source of their income. It is pretty awesome what you can do now with these tools, from personal use to business. The barrier to entry now is almost nothing beyond an internet connection and some basic hardware. I just hope they don’t find a way to transmit smells over the internet.